The Taynuilt Hotel and Restaurant has reinforced its rapidly growing reputation as a dining destination by winning its second AA Rosette for culinary excellence only a few months after achieving its first one. 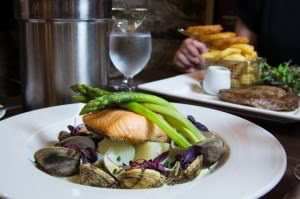 The recently refurbished coaching inn 12 miles south of Oban, recently voted best place for informal dining in the Lomond and Argyll region in the 2016 Scottish Hotel Awards, was acquired three years ago by young Chef-Patron John McNulty. In a further move towards using organic produce the Taynuilt Hotel recently installed a polytunnel to grow its own vegetables and herbs, uses the services of a local forager who brings in edible plants from hills and woods around the village, and smokes its own fish and meat in-house. Under the guidance of General Manager and sommelier David Lapsley, the Taynuilt Hotel and Restaurant is also renowned for its wines selection, and stocks around 100 malt whiskies and 50 gins. Last year it launched a specialist wines and spirits shop, The Drammery. It is perfectly situated as a base for exploring the Hebrides and West coast. The hotel’s 10 bedrooms are named after Scottish lochs, and feature antique beds and other furniture and fittings. The Taynuilt Hotel and Restaurant is open Wednesdays to Sundays inclusive for lunch and dinner.